The red on my left hand side is Manic Panic Pillarbox Red. The orange next to it is a combination of the Pillarbox Red and Manic Panic Electric Banana (I would've used Manic Panic Electric Lava if I'd had it). The yellow next to that is more Electric Banana. The green is where it starts to get tricky. If I'd had them on hand I would've used Manic Panic Electric Lizard (with a little Electric Banana mixed in to make it more neon) for the green and Manic Panic Bad Boy Blue for the blue. Unfortunately I didn't have the green or the blue. But I did have Manic Panic Shocking Blue, Electric Banana and a lot of Herbal Essences Tousle Me Softly Conditioner. I mixed the conditioner with the Shocking Blue until I got the shade you see on my hair in this photo. The green is some of this blue/conditioner mixture with some Electric Banana mixed in. Which brings us to the lavender - Manic Panic Ultra Violet. Followed by the pink - Manic Panic Red Passion (it shows up pink on my hair) and we've come back around to Pillarbox Red. I bleach my hair with Manic Panic 30 vol. and I usually only bleach my roots. In between dyeing I'll let the colors fade to pastels on their own so I can cover them up with new colors without having to bleach the majority of my hair. Also, I'm sorry it's taken me so long to post this self portrait here. And I'm REALLY SUPER sorry that I'm such an impossible person to get into contact with. **********UPDATE*********So it's been six days, front page, 547 comments, 6,005 favorites and 33,540 views later and some have asked me how I created the pattern in my hair, which made me realize I forgot to describe how I sectioned my hair before dyeing -- oops! Anyway, I parted my hair completely down the middle and put my hair in pigtails. Then I parted each pigtail the exact same way, forming four pigtails. Then I did the same thing with those four, making eight pigtails. Starting on my left hand side, I dyed the section over my ear Pillarbox Red, then dyed the section above that orange, the one above that yellow, and so on. Thank you so much for all the favorites, views and kind comments! I was completely stunned to see myself on the front page! How many crayons did it take you to accomplish this? Wow! The time you must have spent dyeing the hair just right and doing the braids! Impressive! First time I've seen it, and it's cool. Wow--that is really, really good. And it's so vibrant. Sorry about art thieves, though. 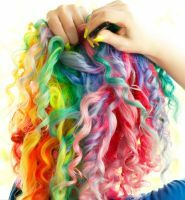 I'd love to have my hair like that! Rainbows are the best! This is absolutely beautiful, so amazing. Love colours! It's so beautiful! 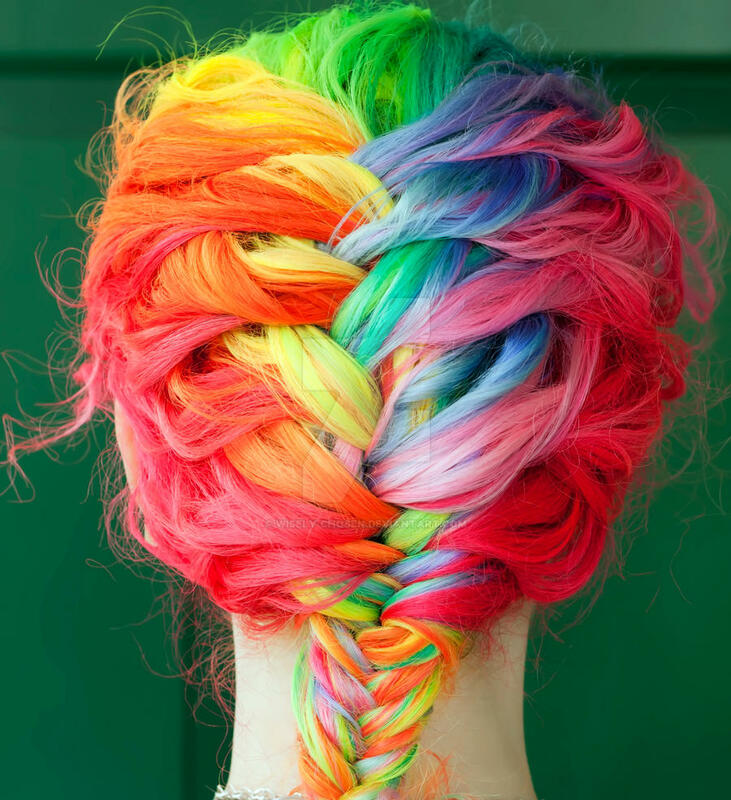 I see The rainbow în your hair! Oh mon dieu, que tresse est belle! wow...this is truly beautiful, my dear! I love it! My jaw literally dropped when I saw this. This is beautiful! The colours are so intense and vibrant! Amazing job! this is amazing, fantastic job! pretty awesome. I'm toying with the thought to do that myself. Your hair is so incredible, and it infuriates me to see how many people have taken it without permission or credit. 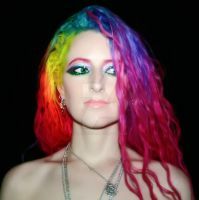 I'm pinning this to Pinterest, along with a link to your flickr and proper credit because people should see YOUR hair! how long did you have to wait after bleaching the roots to color it? Oh my god I want your hair!!! It's gorgeous! this image is being used for a campaign. might wanna look into it. no i have a face whit this popular picture! love it! Man, I can't even french braid! never mind doing it in RAINBOW! Just beautiful! it looks like someone stole it again i just saw it on esty [link] just to let you know. But love the colors. 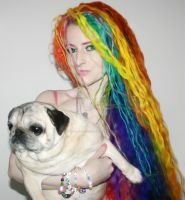 I saw this picture first on the manic panic website, google images led me to the picture of you and your pug and finally here to deviantart, and I am so very glad to see that the picture wasnt of someone they hired or of a wig/mannequin head. Your hair is absolutely beautiful and I am glad to be able to tell you. 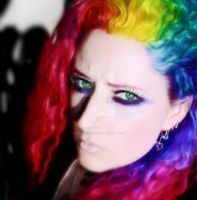 I do hope Manic Panic got your permission before using the photo, you may have used their color but that does not entitle them to use your photo. I am sorry that it has been stolen so many times.